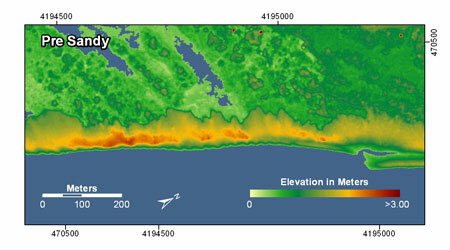 The USGS conducted an airborne lidar survey of the topography of Virginia in November 2012, after Hurricane Sandy passed by to the East. 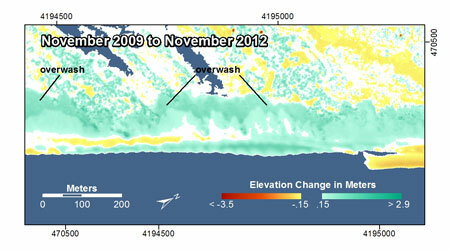 In November 2009, the USGS conducted a similar survey after Ida (also known as "Nor'Ida") impacted the Northeast United States. Comparing these two surveys reveals the nature, magnitude, and spatial variability of hurricane-induced coastal changes, such as beach erosion, overwash deposition, and island breaching. 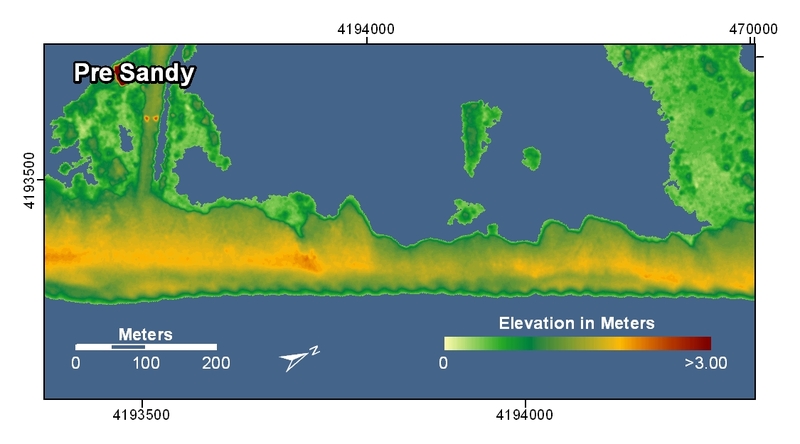 At least one other large storm occurred in the period between the two lidar surveys, so these data document the cumulative impacts of these events. Virginia Index Map. Click on the yellow highlighted numbers to see maps of that location. The numbers correspond to the pre- and post-storm photograph comparisons. 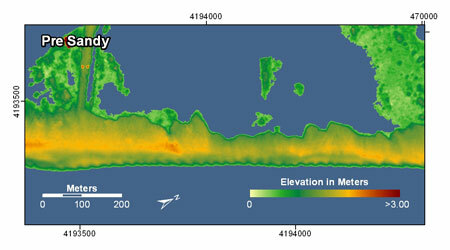 In the inset map, the green line is Hurricane Sandy's track and the red line indicates the shoreline where post-storm airborne lidar data were collected post Hurricane Sandy. Location 1: Assateague Island, VA. 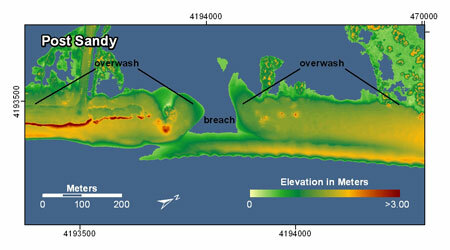 Along this stretch of the island, overwash deposits from earlier storms are evident in the pre-storm map. 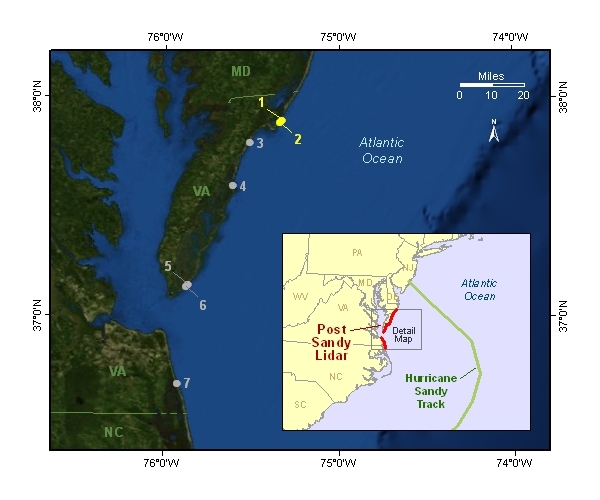 The pre-storm lidar was obtained after Nor'Ida (2009) but prior to Hurricane Irene (2011) so the change in the post-storm map incorporates both Irene and Sandy. (Note that in the photo comparisons of this location, the pre-storm photo was taken prior to both and Irene and Nor'Ida). 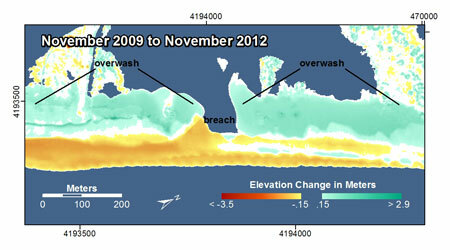 The post-storm and difference maps show even more extensive overwash deposits in a thicker layer farther inland. The shoreline has moved seaward indicating the beach had been severely eroded after Nor'Ida and had recovered since then. Location 2: Chincoteague National Wildlife Refuge, Assateague Island, VA. 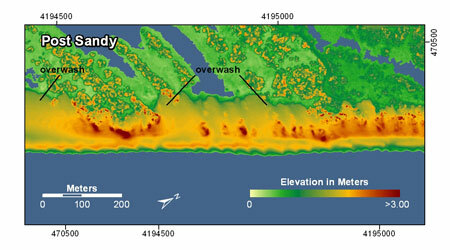 The pre-storm map shows that this part of the island is very low-lying and narrow and has been overwashed by earlier storms. During Hurricane Sandy, not only was there extensive overwash and deposition, but an island breach occurred, cutting the island in two. 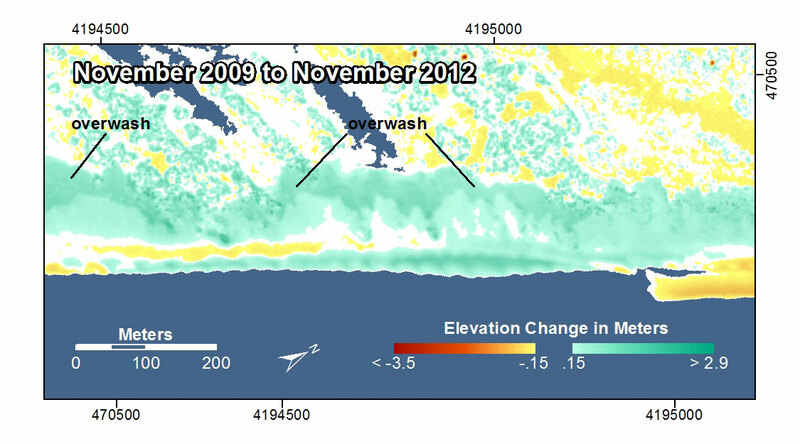 In the post-storm map there is evidence that the breach is beginning to fill in naturally which is not evident in the photo comparisons. To the left of the breach (south), road crews have pushed sand off the roadway into a line of piled sand.